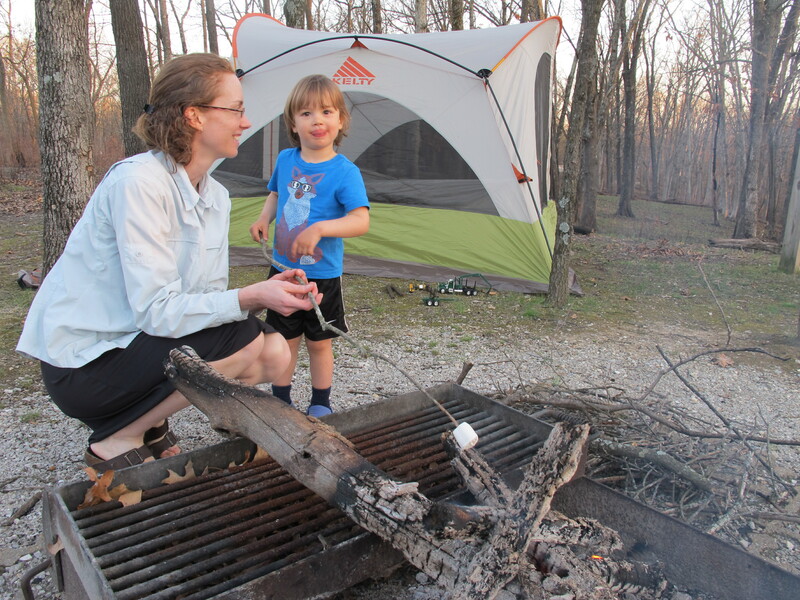 After our “adults only” camping trip last fall, we decided to venture into “camping with a toddler” this spring. The idea of joining the Missouri Mycological Society’s (MOMs) “Morel Madness” weekend spurred the trip, but their gathering was closer to Kansas City than to St. Louis this year, and I wanted something a bit closer to home, as well as something we could do on our own schedule. Enter Cuivre River State Park, the site of last year’s “Morel Madness,” conveniently located about ninety minutes from home. (For those not from the StL area, the common/local pronunciation of this state park name is “Quiver” River, no doubt a horrible bastardization of the French word for copper, for which the park/river is named.) The park was lovely — nice campground, well-maintained hiking trails (well, the little we saw of them), and many areas nicely cleared from recent-ish controlled burns. 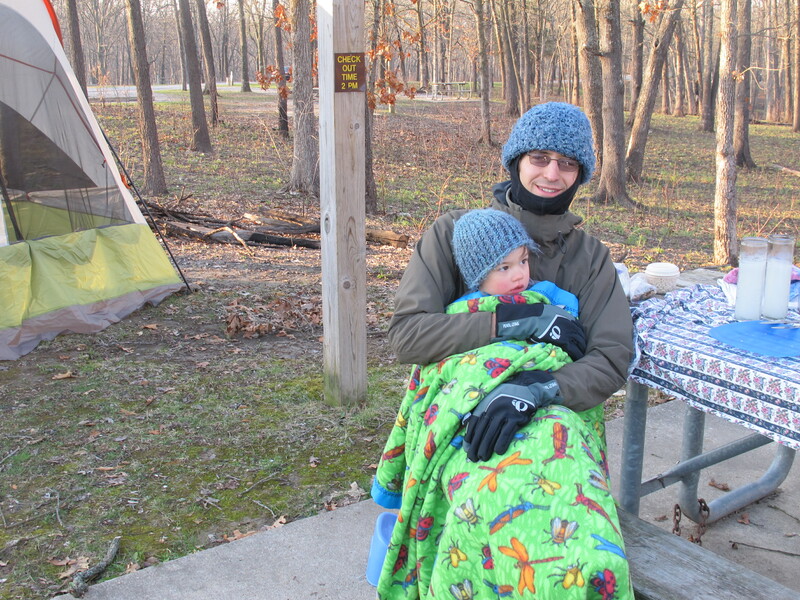 When we camped last fall, I remarked on the lack of space in the car for Gabriel. It wasn’t any different this time, especially with the addition of a third sleeping bag — we just smushed everything in more. I’m afraid in the not-too-distant future, we’ll need to borrow or rent a larger vehicle for camping trips. After getting stuck in Friday afternoon traffic on the way out of St. Louis, we were extra glad we’d reserved a campsite ahead of time (there were actually plenty of vacant sites when we arrived, but it was one less worry), and we arrived in time to pitch a tent, start a fire, eat dinner, and roast marshmallows for s’mores. The afternoons and evenings were warm, but the mornings start out a bit chilly, and, after enjoying Friday night, Sir spent a good deal of Saturday morning requesting Baba’s (grandma’s) house. He started Saturday with a 2+ hour sleep debt, having both taken over an hour to fall asleep (due to light and noise at the campground) and woken early. Le sigh. We explained that we’d be staying at the campground another day, and made plans to take a hike. You know, just a couple of miles. With a toddler. 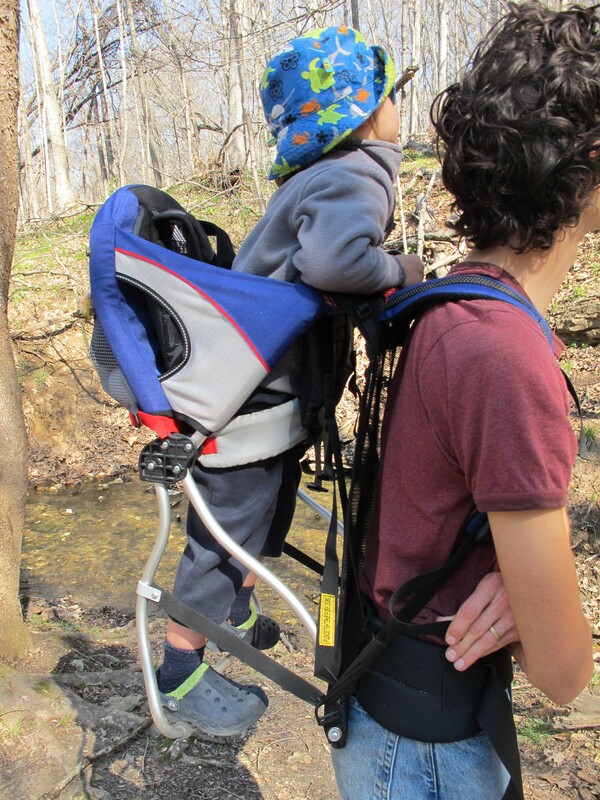 We chose a 4.75-mile loop trail, planning to alternate between Gabriel walking and riding in the backpack child carrier. Hiking was not particularly to Sir’s liking. Over the course of two hours, we heard, “Why going on hike? Me not want hike,” on almost constant repeat. He didn’t really want to walk, but carrying 36+ pounds of squirmy toddler in the back pack was no picnic. Fortunately, the loop we chose had a cut-off option, making it about half the total distance (a bit over two miles). If we had had to cover the entire 4.75 miles, we’d probably still be out on that trail! It was a near thing, but all three of us made it back to the car, and, subsequently, to the campsite, for some much-needed lunch and rest time. After our morning hiking experience, we kept the afternoon low-key, honoring Sir’s request to visit the play ground. That evening, we built a nice fire and enjoyed grilled bread and cheese sandwiches, plus more s’mores. Saturday night’s bedtime was much like Friday’s. It took a long time and required one of us staying in the tent with Sir until he fell asleep. Our overall campsite conditions were made a bit better by the departure of our Friday night “neighbors,” who were exceeding their campsite occupancy limit and showed little concern for campground quiet hours. We also scoped out some campsites that might be better situated for quiet (the site I picked, which looked good online, actually had quite a bit of passing foot and vehicle traffic). Noise level aside, two months away from the lightest day of the year, it’s pretty darn bright at 7:30pm in a tent. For future kid-camping, we decided late September would be ideal — similar temps to late April camping, but earlier nightfall. Matthew couldn’t resist building one more fire on Sunday morning, and after breakfast, we had an Easter egg hunt. We decamped rather efficiently, and, after one last playground visit, returned home to recover. All-in-all, it was a successful first camping venture, but I’m glad to be [almost] unpacked, cleaned up, and back to normal sleep conditions. 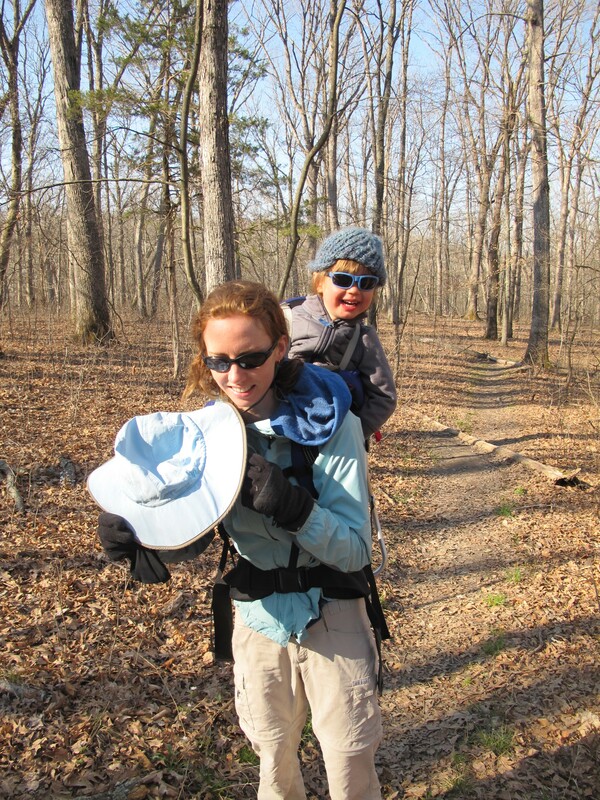 This entry was posted in Green Ideas, My Life and tagged camping. Bookmark the permalink. We didn’t really even end up looking for morels, though that was certainly part of the original plan. We were also thinking it might be a little early, given the cold winter and chilly spring. At this point, I don’t think we’ll get out to look again this season. Maybe next year??? What campsite did you choose? Also what were the better alternatives? Planning a trip with our 2 little girls within the month and very much looking forward to it. Thanks for any input or suggestions!